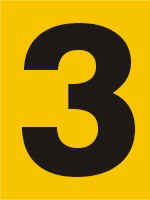 Our Reflective Numbers are made with 3M 3200 Engineer Grade Reflective Sheeting. They are 1.5 inches x 2 inches, and are sold per number or packs of 100 numbers. They are perfect for use on transformers, junction boxes, pipe identification, etc. Our Reflective Numbers are made with 3M 3200 Engineer Grade Reflective Sheeting. They are 1 inch x 1 1/2 inches, and are sold per number or packs of 100 numbers. They are perfect for use on transformers, junction boxes, pipe identification, etc.